The Sooners shot up our rankings quickly, moving from seventh to third in just one season. Of course, finally being able to win a BCS game under Bob Stoops certainly helped. Even if the victory came against overmatched UConn in the Fiesta Bowl, the BCS bowl win coupled with down years by Texas, Alabama and USC catapulted Oklahoma into the top 3. (They also now have four Big 12 championships in the last five years.) Whether or not OU remains ranked this high might be dependent on whether or not Texas rebounds after suffering its first losing season under Mack Brown. If the Longhorns stay down, there’s no reason to think the Sooners won’t rule the roost for a while, especially with Nebraska heading to the Big Ten. After winning the national championship in 2010, we thought Nick Saban’s team would steadily climb in these rankings every year. But ‘Bama took a step back this season record-wise, falling to 10-3 and settling for an appearance in the Capital One Bowl. The low point came in the final regular season game of the year when the Tide lost to Auburn 28-27 at home despite jumping out to a 24-0 lead in the first half. Still, Saban won’t have his team “down” (we use quotation marks around the word “down” seeing as how ‘Bama still had a winning year) for long and we suspect them to push Ohio State, Florida and Oklahoma in the short term. It’s been three years now since Les Miles took his team to a BCS bowl game. The Tigers won the 2008 national championship but since then, their offense has sputtered since JaMarcus Russell left the program to become the biggest bust since Ryan Leaf graced the NFL with his presence. Maybe their 41-point outburst in the Cotton Bowl against Texas A&M is a sign that LSU finally has found some offense but if not, they’re ceiling will probably remain right where it is. The Ducks jumped eight spots from last year thanks to yet another amazing coaching job by Chip Kelly. While their loss to Auburn in the title game stung, the pure fact that they appeared in the national championship was enough to catapult them into the top 5 (coupled with a Pac-10 title as well). Last year, we gave the Ducks two points for hiring Kelly but we bumped that up to seven this year because obviously the man can coach. Thanks to Kelly’s high-powered offense, it looks like many more Pac-10 titles are in Oregon’s future (and maybe that elusive national championship). The Hokies got back on track this year by scooping up their fourth conference championship in the past six years. They also made their fourth BCS bowl appearance in the last six years, but were routed by Stanford in the Orange Bowl. Frank Beamer’s team should continue to compete for ACC titles, but the Hokies still seem like a long shot to make a national title appearance. Auburn didn’t even have a spot in these rankings last year before Cam Newton came around and set the college football world ablaze with his Heisman Trophy-winning talent. An undefeated season, a SEC championship and a win over Oregon in the national title game later and now the Tigers have a seat in our top 10. But will they stay here? Newton is jetting off to the NFL, as is defensive tackle Nick Fairley. The Tigers could crash and burn next season playing in a tough conference. We wrote last year that USC could fall in these rankings after Pete Carroll decided to leave the program, but little did we know the NCAA would hand the Trojans a two-year bowl ban for violating rules. Now USC can’t compete in a BCS bowl for the next two years, which certainly hurts the Trojans in these rankings. So did their 8-5 season last year, which included embarrassing losses to Washington, Oregon State and – gasp! – Notre Dame. Seeing as how they can’t compete in a bowl again next year, this won’t be the last time the Trojans drop in our rankings. Can you say crash and burn? A year after making a national title appearance, the Longhorns suffered their first losing season under head coach Mack Brown. They went 5-7 overall, 2-6 in the Big 12 and shockingly finished last in the conference. It was the first time a Brown-led Longhorn team failed to qualify for a bowl and after losing Will Muschamp to the Gators in the offseason, there’s no doubt change is coming. Chances are UT will recover, but how high will they climb the Big 12 standings in one year? 2010 didn’t go as planned for the Broncos. Things started off well enough, as Boise won its first 10 games, which included a 33-30 upset over No. 10 Virginia Tech in the opening week. But Nevada shocked the Broncos in the second to last week of the regular season and their slim national championship hopes went out the window. They settled for the Las Vegas Bowl, where they beat Utah 26-3. The Broncos will get their chance at redemption when they join the MWC next season, even though their biggest opponent, TCU, will be heading for the Big East in two years. The Mountaineers took a step back in our rankings after struggling in a bad Big East. They still had a winning season but they watched UConn win the conference and settled for the Champs Sports Bowl, where they were thumped by NC State. Losing the explosive Noel Devine to the NFL won’t help their offense in 2011. TCU makes a huge leap in the rankings after qualifying for their second consecutive BCS bowl and beating Wisconsin in Pasadena. The win over the Badgers was huge for Gary Patterson’s squad, which mowed through its soft schedule last year only to be embarrassed by a better Boise State team in the 2010 Fiesta Bowl. The Frogs proved this time around that they weren’t going to settle for just a conference championship. The next two years will tell a lot about Patterson’s team. Boise State joins the MWC next year and then in 2012, it’s off to the Big East for TCU. It’s time to find out how good this program can really be. The Cornhuskers moved up in our rankings after finishing as the Big 12’s runner up, but there’s no doubt 2010 didn’t go the way the Nebraska faithful thought it would. They lost at home to a bad Texas team in mid October and then an injury to quarterback Taylor Martinez cost them a win against Texas A&M in November. They fought hard in the Big 12 Championship Game before losing to Oklahoma, but then didn’t bother to show up for the Holiday Bowl against Washington. But let’s not overlook how this team beat No. 14 Oklahoma State and No. 6 Missouri in back-to-back games in October and still finished a very respectable 10-4. They’ll have their work cut out for them next year in the Big Ten, but the Huskers are built for the conference and not having to face explosive offenses like Oklahoma State and Oklahoma should help their cause. Georgia Tech only moved back two spots but if the Jackets have another year like they just did, then they’ll be moving back further next season. A year after making a BCS appearance, the Jackets played .500 ball in the regular season and then were held to only a touchdown by Air Force in the Independence Bowl. Losing Josh Nesbitt to injury certainly hurt Paul Johnson’s triple-option attack. But the Jackets had already lost three games prior to Nesbitt’s injury, which included an embarrassing 28-25 defeat to Kansas in mid September. Hopefully Johnson can resurrect things in 2011. Considering they replaced all three starting linebackers and their quarterback from a year ago, it’s not hard to see why Penn State took a step back in our rankings this year. But they held their own, especially considering they had to play Alabama, Iowa, Ohio State and Michigan State this season. Their loss at home to Illinois was unexpected but again, this was a young team that still found a way to win seven games with four ranked opponents on their schedule. They probably won’t win a Big Ten title next year, but the Lions will be competitive. They usually are under Joe Pa.
Wisconsin cracks our rankings after putting together a great season, which included back-to-back wins over Ohio State and Iowa in October. If it weren’t for that Oct. 2 loss to Michigan State, the Badgers would have been in the national title discussion. The loss to TCU in the Rose Bowl hurt, but Wisconsin made a statement to the rest of the Big Ten that it isn’t going anywhere. It’s going to be fun to watch the Badgers compete against Ohio State and Nebraska next season. Iowa only drops one spot in our rankings but the Hawkeyes had one disastrous season. The loss to Arizona in the third week of the season hurt, as did the three-straight losses to Northwestern, Ohio State and 3-9 Minnesota. Then star receiver Derrell Johnson-Koulianos gets charged with operating a drug house (charges were later dropped) and starting running back Adam Robinson is suspended for violating team rules. Beating Missouri in the Insight Bowl was the one saving grace of the season, but that’s a far cry from topping Georgia Tech in the Orange Bowl one year earlier. 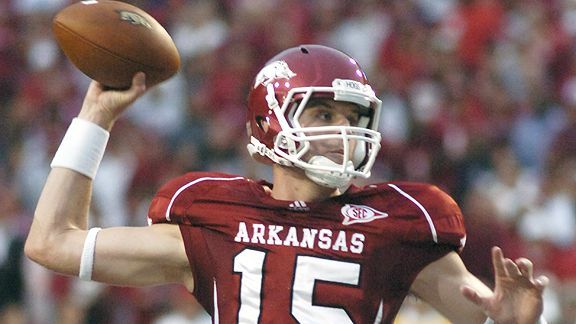 If they can successfully replace NFL prospect Ryan Mallett, we get the feeling that Arkansas will be a part of these rankings for years to come. The Razorbacks overcame losses to Alabama and Auburn earlier in the season to win six games down the stretch, including back-to-back victories over Mississippi State and LSU in November. A win over Ohio State in the Sugar Bowl was not to be, but clearly Bobby Petrino has this program heading in the right direction. Rich Rodriguez may have produced his first winning season in Ann Arbor, but embarrassing losses to Michigan State, Wisconsin, Ohio State and then Mississippi State in the Gator Bowl was all UM could bare. In three years, Rich Rod’s collective record against Ohio State and Michigan State was 0-6. That’s something new head coach Brady Hoke better change if he’s going to last long as Rich Rod’s replacement. He certainly has his work cut out for him, especially considering he needs to build a defense after the previous staff pretty much ignored that side of the ball for three seasons. Really? No Stanford? Harbaugh is the shee-ot, but he’s not packing up the whole program and bringing it with him . . . . The points just aren’t there yet. One good season does not a program make. The Buckeyes also had another great recruiting class. They should be set at QB for the next 6 years with the gray shirt recruit Cardale Jones to go along with Braxton Miller. I just don’t see how Michigan made the list. Are they still hanging on by a thread due to points from the Lloyd Carr era? Rich Rod was a disaster and the program seems to be entertaining Notre Dame-esque delusions of former glory. Yes, they are holding on due to the success they had back in ’06 and ’07. Even with the recent struggles, Michigan is still a prestigious program. are you kidding me? ohio state 1 and florida 2. WTF.. Who comes up with this non-sense. Then Penn State,Michigan,GT, and USC in top 20? wow… this is something else. South Carolina and Standford should be on the list. I will answer your thoughtful, constructive questions one by one, Brandon. 1. We are not kidding you. 2. You can read! Yes, OSU and Florida are #1 and #2. 3. Writing is another matter, apparently. I assume “Who comes up with this non-sense.” is a question even though it doesn’t have a question mark (and nonsense doesn’t have a hyphen, by the way). Anthony and I came up with it, and we explained how these (mostly objective) rankings are compiled. OSU had BCS bowl wins in 2009 and 2010, conference championships in 2006, 2007 and 2009, and two national championship runners up in 2006 and 2007. That’s one hell of a five-year resume. Florida didn’t have a great 2010 and got docked 10 points for losing its coach. But it had a BCS win in 2009 and national championships in 2006 and 2008. 4. As for the two teams you’d like to see on the list, South Carolina and “Standford” (I assume you mean Stanford) — all SC did in the last five years was one conference championship runner-up and two bowl appearances. However, the program is pointing up with the ol’ ball coach at the helm, and in another year they may crack the Top 20. Stanford had a great season but lost its coach (-5 points) and didn’t do anything from 2006-2009. One year does not a great program make, especially when you lose your coach. What about those FSU Seminoles? 10 win season in 2010, bowl victory, new coach, #1 recruiting class?